I have come across the terminology ‘velouté’ on various occasions, but I have never had the pleasure of tasting one until our evening at the opening of Liam Tomlin Food at Leopard’s Leap. A velouté is one of the five “mother sauces” in French cuisine and is basically a stock thickened with a blonde roux. Anyone who has made a béchamel sauce before, will be familiar with a roux. It is a mixture of equal parts butter and flour. The sweetcorn and basil velouté I tasted was amazing, and the weekend after our lovely evening, I decided to try and recreate the dish at home. I decided however, once I had started, to not use a basil oil but instead to make use of the truffle oil that we received in our gift box. This can be served at room temperature so you can make this ahead of time if you are planning a dinner party. Mmmmmmmm, just look at the beautiful colour. Gorgeous! Thank you for teaching us what a veloute is today.. well, at least, thank you for teaching me, I had no idea! That just sounds so fun and approachable!! Tandy, a fantastic recipe and something I think I’ll use to tempt my Mum with! Thanks! Consider this recipe bookmarked!! Hopefully come summer, and fresh sweetcorn I’ll be making this, it sounds so delicious! How unique and lovely! It looks very delicate! I tried to recreate a veloute recently — but it wasn’t blog worthy! Yours is certainly a winner — nicely done! I would love to try this. 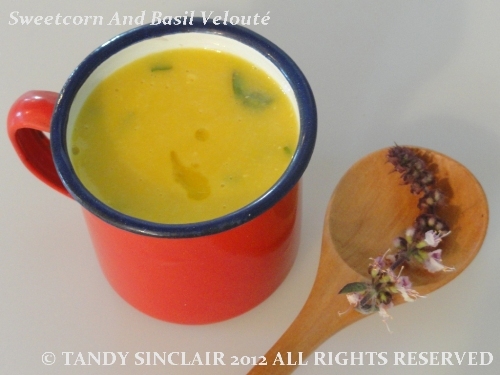 I love a good & tasty sweetcorn soup & to combine it with basil: I didn’t know that would be so tasty! I learned a great combo here! I love the texture of veloutes, they’re so silky smooth! I’ve also come across veloutes a lot recently but I’m not sure I’ve had one. I’m not always sure if I like cold soups though so I think I’d serve it warm. An interesting twist on corn chowder! Not sure I would have thought to put corn and basil together – not sure why though. This sounds lovely Tandy. This seems quite incredible! Have always been interested in gastronomy! Yummy! Never had a velouté but it sure seems delicious! This sounds delicious!! A nice question for the Friday Food Quiz. Ooh that sounds good! Even the word velouté sounds like silk and velvet! I purchased some lovely macadamia oil infused with lemon myrtle recently and while I think that the basil would drown out the subtle taste of the lemon myrtle it gives me some more ideas on how I can use it. This sounds really special, Tandy. I would love to taste it. Where can one buy truffle oil?